Hundreds of anti-nuclear activists are coming to the end of a month-long continuous protest against Britain’s Trident nuclear weapons programme. 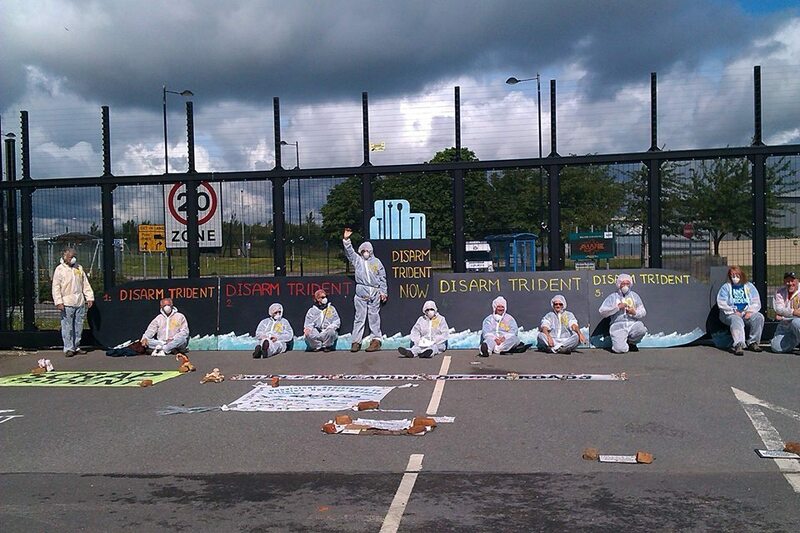 Due to a distinct lack of mainstream media coverage on the demonstrations, The Canary has spoken to Trident Ploughshares — organisers of the mass disruption at the Atomic Weapons Establishment (AWE), at Burghfield in Berkshire. Nothing else seemed to be happening in the way of resistance to Trident renewal, and the vote or decision by the UK government could have been at any time. Other groups will be concentrating their efforts later in the year, but as a direct action group we decided to do it now. A major programme of construction work is underway at Atomic Weapons Establishment sites to ensure that AWE remains able to manufacture nuclear weapons for the long term future, and will be able to design and develop a new UK Trident warhead. Over the decades, thousands have been arrested for nonviolent and peaceful acts of protest at Trident-related sites in Britain. That said, there have also been a number of spectacular acquittals following major direct actions. One of the most famous was in 1998, when the fourth Trident submarine was rolled out in Barrow. After swimming into the dockyard, two courageous women climbed onto the conning tower of the chillingly-named HMS Vengeance. After damaging the testing equipment, they painted “ILLEGAL” and “DEATH MACHINE” on the submarine, and their work delayed its launch for several months. After three trials, the case was dismissed as so many jurists believed the action was justified. A year later, Zelter and two other women took a boat out on Scotland’s Loch Goil where they climbed aboard the ‘Maytime’, a floating testing laboratory, which ensures invisibility for the Trident system. Entering through a window, the women threw all the testing equipment into the Loch. After they spent 5 months on remand, the sheriff and jury agreed that, given international law, their action was justified in trying to stop preparations for mass murder. Asked to describe the main message behind the current month-long blockade of the Berkshire bomb factory, Zelter was frank. 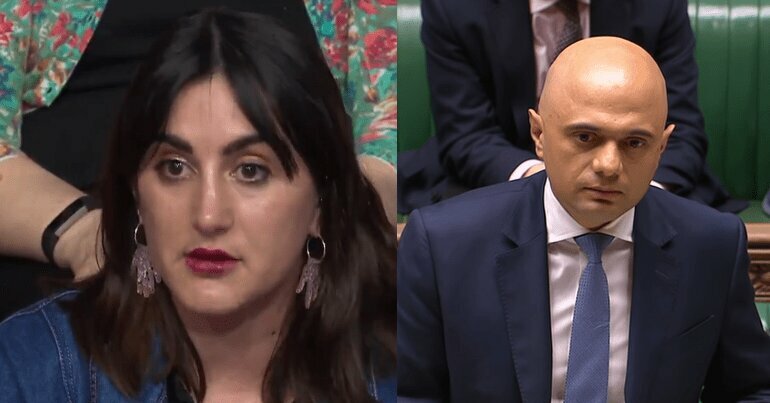 Claiming the UK’s nuclear weapons system is illegal, immoral and a waste of money, she said the protests have also proved that a range of social change movements can join forces to nonviolently and safely disrupt work on Trident renewal. Those participating have included European peace and justice groups and anti-militarist organisations from Finland, Belgium and Germany. Days of action have also been organised by CND, students, academics and regional groups from London, Yorkshire and Wales. Other blockaders have included Women in Black, various women’s and religious groups plus cyclists and choirs. Attempts to prevent business as usual in the atomic weapons factory included a variety of creative methods. Some protesters locked themselves onto vehicles and blockades in front of the Construction Gate. Others set up tents and built a ‘peace camp’ where they slept and cooked and provide a constant presence to keep the gate blocked. As a large police presence monitored those entering the facility, workers were forced to leave their cars and walk. Many groups chose to demonstrate at this point with banners, songs and creative displays. Blockaded! 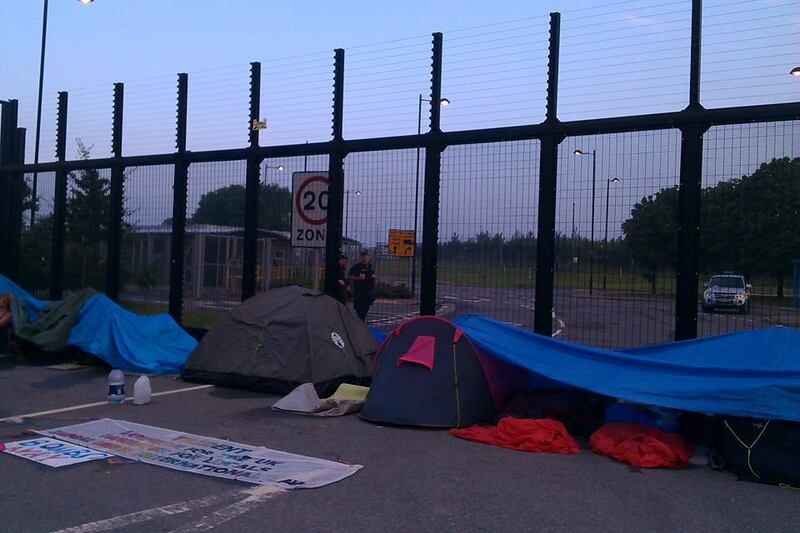 Protesters stop work at AWE Burghfield – 20th June. Image: Facebook/Trident Ploughshares. On 7 June, a woman from Norfolk with three Finnish conscientious objectors used a car as a lock-on with two other people locking on to tubes that completely blocked access to this road for many hours. They were arrested and charged with highway obstruction. A large replica of a Trident submarine, made out of plywood was put against the construction gate by a Welsh group from Knighton and people locked onto it. 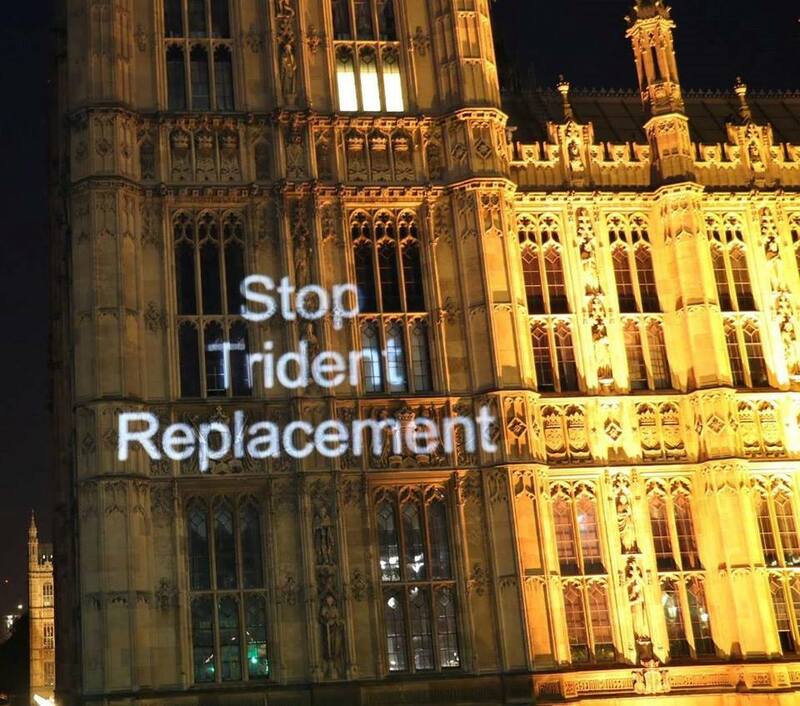 Earlier this year, figures drawn up by the Campaign for Nuclear Disarmament (CND) suggested that the total cost of replacing the Trident nuclear missile system will come to at least £205bn — far more than previously estimated. In May, CND general secretary Kate Hudson said the new calculations, drawn from actual government figures, show the bill has spiralled beyond all expectations. We have the people power to create change and persuade others to join us to stop threatening mass destruction with nuclear weapons and start creating a better world. Trident Ploughshares has issued a call out for support. 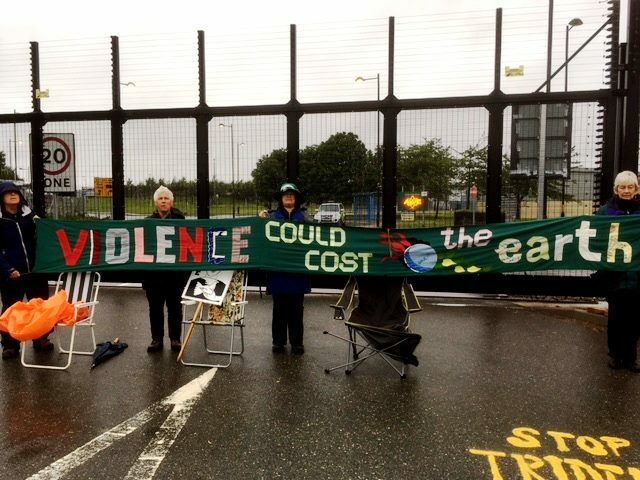 The group is inviting anyone who cares about stopping nuclear weapons to get to AWE Burghfield on 30 June for the final day in the month of direct action.